the observatori: Good Day. Sunshine. I'm an unapologetic fair weather rider. Especially when it comes to the cold. I like it when I can feel my fingers and toes. I like it when my speech is not impaired by involuntary convulsions. I like it when the contents of my water bottle are not frozen. 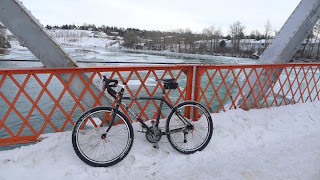 Fortunately, mother nature dished up a couple of relatively nice days for me to test out my new wheels. In my usual blinders-on fashion, I accompanied a few of my friends for a ride on Sunday. 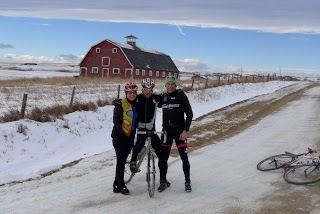 I'm not saying that it was a bad ride (for the record, it was awesome), I'm just saying that a girl could choose a more gentle re-entry into the sport than a winter ride with three super fit dudes, one of whom is now a pro. It took me a few hours to crawl back to the city after I broke from the group. Shattered is a strong word. And I'm not afraid to use it to describe how I felt rolling into Panorama Hills. There's a different word that I would use to describe the 15km that followed. But it was a good day. With lots of sunshine. And good friends. Winter riding isn't so bad, I guess. dontcha luv that shnook rch!...... kool barn 2.